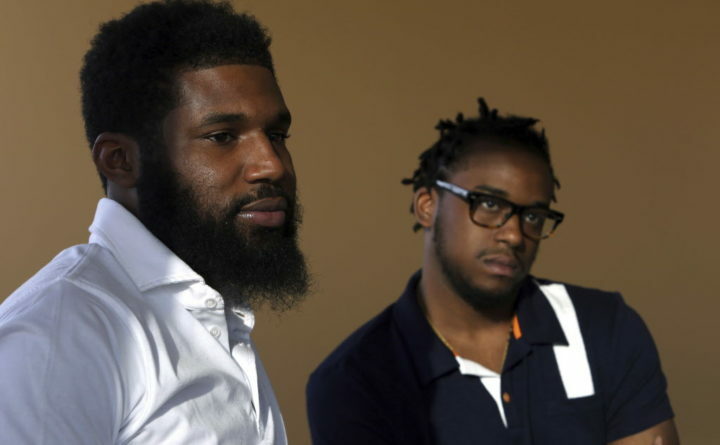 In this Wednesday, April 18, 2018 photo, Rashon Nelson, left, and Donte Robinson, right, listen to a reporter's question during an interview with The Associated Press in Philadelphia. PHILADELPHIA — Rashon Nelson initially brushed it off when the Starbucks manager told him he couldn’t use the restroom because he wasn’t a paying customer. Nelson and Robinson were led away in handcuffs from the shop in the city’s well-to-do Rittenhouse Square neighborhood in an incident recorded on a white customer’s cellphone. In the week since, the men have met with Starbucks’ apologetic CEO and have started pushing for lasting change at the coffee-shop chain, including new policies on discrimination and ejecting customers. On Thursday, they also got an apology from Philadelphia Police Commissioner Richard Ross, a black man who at first staunchly defended his officers’ handling of the incident. At a news conference, a somber Ross said he “failed miserably” in addressing the arrests. He said that the issue of race is not lost on him and that he shouldn’t be the person making things worse. “Shame on me if, in any way, I’ve done that,” he said. He also said the police department did not have a policy for dealing for such situations but does now, and it will be released soon. Nelson and Robinson said they went to the Starbucks to meet Andrew Yaffe, a white local businessman, over a potential real estate opportunity. Three officers showed up not long after. Nelson said they weren’t questioned but were told to leave immediately. Yaffe showed up as the men were being handcuffed and could be seen in the video demanding an explanation for the officers’ actions. Nelson and Robinson did not resist arrest. Nelson said he wondered if he’d make it home alive. Starbucks has said the coffee shop where the arrests occurred has a policy that restrooms are for paying customers only, but the company has no overall policy. The men’s attorney, Stewart Cohen, said they were illegally profiled. The arrests prompted protests at the Starbucks and a national boycott. Kevin Johnson, CEO of the Seattle-based company, came to Philadelphia to meet with the men, called the arrests “reprehensible” and ordered more than 8,000 Starbucks stores closed on the afternoon of May 29 so that nearly 175,000 employees can receive training on unconscious bias.